1. Beat the pork pieces with a rolling pin between 2 sheets of clingfilm until thin. Dip in the egg. 2. Mix the breadcrumbs, half the parsley, lemon zest and seasoning then coat the pork pieces in the crumbs. 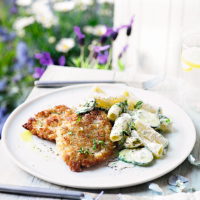 Heat the oil in a large frying pan and fry the pork escalopes in 2 batches for 5 minutes, turning halfway until cooked throughout. 3. Meanwhile, cook the pasta in boiling water for 11 minutes, adding the courgettes for the last 4 minutes. Drain, keeping 2–3 tbsp water in the pan. Add the pasta back to the pan and stir in the soft cheese, lemon juice, remaining parsley and seasoning. Serve with the escalopes.